Best Deal in Astor Farms Sanford – Bank Foreclosure – Just in time to claim your $8,000 tax credit, so act today! Wow! 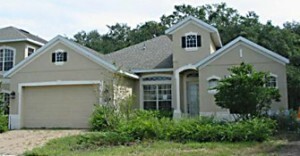 This bank owned home was just listed in The Preserve at Astor Farms in Sanford FL. If you are looking for a true steal in this market, this is it! Apart from some repairs that need to be done on the drive way, this home is in top condition so as with other REO (= bank owned/ foreclosures) you must act quickly! This home is listed at $219,900. This home on Cains Wren Trail in Astor Farms features 4 bedrooms , 2 bathrooms and a 2 car garage. The backyard is a true oasis with a beautiful pool (needs cleaning) and private conservation view. The home is over 2,200 square feet big and was built in 2006. You will find elegant upgrades throughout the house. Gorgeous kitchen and Master bath! Ceramic tile in living areas and much more! If you have been dreaming about living in this desirable gated community in West Sanford, this is your chance! Prices here are an an all time low! Since time is of the essence, please contact us directly at 407-340-6458 for a showing. This site looks like a great place to find some bank owned homes! I hope they update the information often I will be checking back to see if they do.